Casola Stained Glass Studio, Inc. serves its customers with more than 45 years of experience in designing and crafting decorative glass. 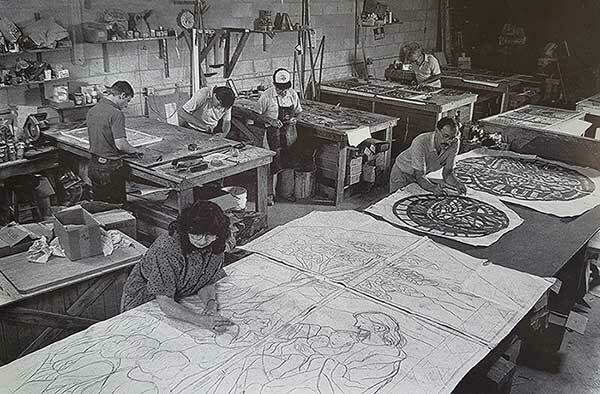 We brought our studio to Fort Myers from New York in 1981. Our studio is full-service and we are proficient in all types of glass, including stained, leaded, faceted, beveled, painted, etched and carved. We combine creative ability with technical knowledge and skill to offer all types of art: Contemporary, Traditional, Abstract or whatever variation the client is looking for. We are available to help you design your own glass windows. Or, if you would prefer, we will create designs for you and we always provide color scale sketches for your approval. Above all, we pride ourselves in giving clients what they ask for. We can offer expert advice on the proper use of the different glass styles, but we’re careful not to impose any style in particular on you. Our designers are open-minded and sensitive to our needs in helping you personalize your home, office, or church. We are experienced in making windows for all settings – ecclesiastical, residential and commercial. We also do restorations. We are dependable and you can count on us to meet deadlines. We are Studio Members of the Stained Glass Association of America and we keep abreast of stained glass trends around the world. A color slid show of our work is available for presentation at your location. For more information, call toll-free 1.800.330.GLASS, or 1.800.330.ARTS. Or you can call us at our local number, 239.939.0055.